Democratic New York Rep. Alexandria Ocasio-Cortez said her staff is drafting a resolution to “define the scope” of a Green New Deal. The initial Green New Deal proposal was drafted by millennial staffers and activists over one weekend. Ocasio-Cortez said a green deal would go beyond a carbon tax, suggesting more regulations and mandates. Democratic New York Rep. Alexandria Ocasio-Cortez said she’s in the “drafting phase” of legislation to “essentially just define the scope” of the Green New Deal she’s championed. Ocasio-Cortez, a Democrat, also hinted that the scope of a Green New Deal would go beyond taxing carbon dioxide emissions. “A carbon tax bill isn’t going to be called a Green New Deal,” Ocasio-Cortez told reporters Tuesday evening. “It could be part of a Green New Deal, but we have to be sure that we define the scope of what comprehensive Green New Deal legislation would look like. Ocasio-Cortez staffers worked with environmental activists late in 2018 to draft a Green New Deal resolution. The draft document, published online as a Google Doc, calls for the creation of a congressional committee to put forward Green New Deal legislation with the broad goals of 100 percent green energy within 10 years and a slew of welfare programs. 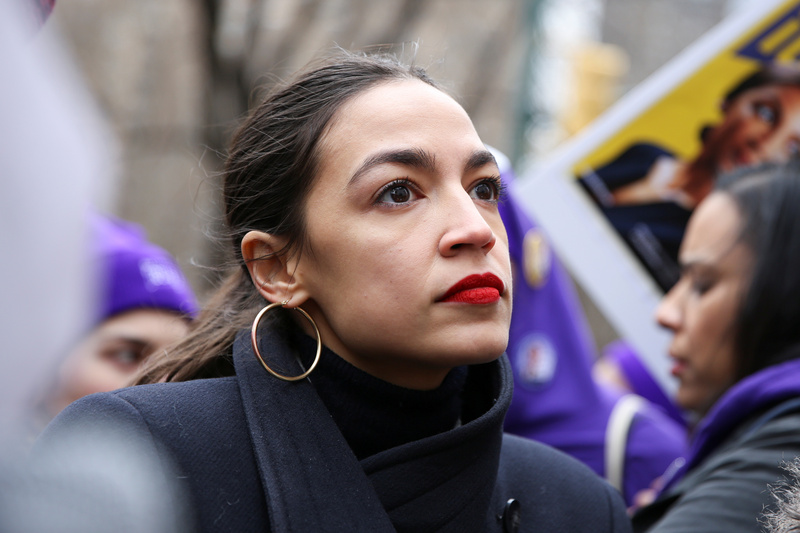 Rep. Alexandria Ocasio-Cortez (D-NY) looks on during a march organised by the Women’s March Alliance in the Manhattan borough of New York City, U.S., January 19, 2019. REUTERS/Caitlin Ochs. Ocasio-Cortez is not the only Democrat who wants to put global warming at the center of their agenda, but she’s part of a growing push on the left to use climate concerns to achieve green and social justice goals. “[A]ll these folks that come after us are looking up and we’re like, the world is gonna end in 12 years if we don’t address climate change,” Ocasio-Cortez said Monday night at an event in New York City. “And your biggest issue is, your biggest issue is how are we going to pay for it? — and like this is the war, this is our World War II,” she added. House Speaker Nancy Pelosi created a Select Committee on the Climate Crisis and appointed Democratic Florida Rep. Kathy Castor as chair. Republicans have yet to name House members to the committee. 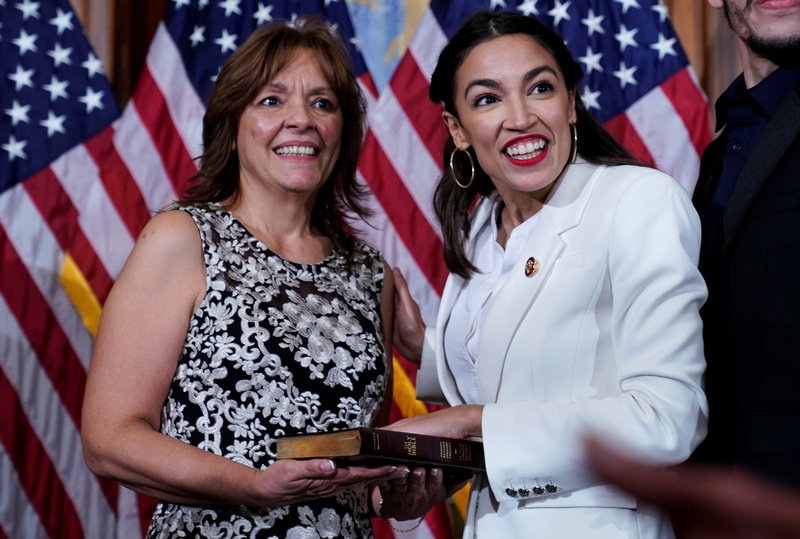 Rep. Alexandria Ocasio-Cortez (D-NY) stands with her mother Blanca Ocasio-Cortez before a ceremonial swearing-in picture on Capitol Hill in Washington, U.S., January 3, 2019. REUTERS/Joshua Roberts. Castor said her first priority would be fuel economy legislation aimed at vehicle emissions. Castor’s climate committee has no subpoena powers and can’t introduce legislation, contrary to what the Green New Deal calls for. Ocasio-Cortez didn’t rule out joining Castor’s committee, but said she didn’t want to take on too much work while still a freshman lawmaker. Ocasio-Cortez is on the House Committee on Oversight and the House Committee on Financial Services. However, Ocasio-Cortez might be able to work with Castor on flood insurance reform. Many Democrats say dire sea-level rise projections mean federal flood insurance programs need reform. “The Financial Services Committee has to do a flood insurance reform bill. We will be involved in that as well,” Castor said in a recent interview with USA Today.